How do rain gardens help with storm water? | Soils Matter, Get the Scoop! How do rain gardens help with storm water? Question: My city just started putting in rain gardens. How do rain gardens help with storm water? Answer: Since the 19th century, most urbanized areas collect and move wastewater to Water Reclamation Plants (WRPs) using a connected collection system. In many areas, WRPs collect both storm water and wastewater in combined sewer systems. In some cities, like Chicago, Los Angeles, and New York, about 90% of the surface is “impervious.” This means that the surface does not let rainfall through. The “Greenest Street in America” is located near Benito Juarez Community Academy, Chicago. The project is an unprecedented demonstration of cutting-edge sustainable design. The sidewalks, bike lanes, and part of the roadway were reconstructed using permeable pavement. 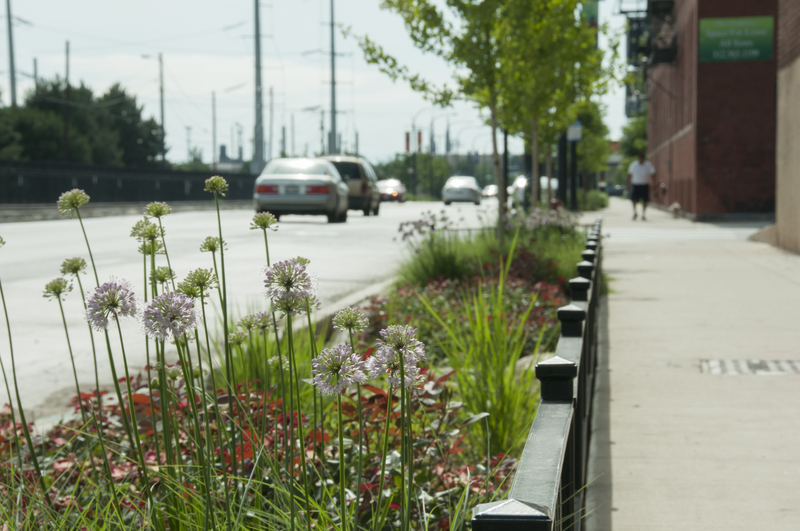 The streetscape includes vegetated planters (shown), bioswales, rain gardens and below-ground infiltration basins. In simulated results, the sustainable streetscape project could capture 80% of the rainfall for a Chicago storm of ¾” in five hours. Credit: Dan Wendt, Chicago MWRD. Rainfall and snow melt make up most of the water that flows over these impervious surfaces and into the storm water system. You may notice that during heavy rains, water collects by storm water drains. The development of cities has changed the drainage system that handles rainfall and snow melt. As a result, the amount of storm water runoff increases. During large storms, water also flows at higher heights. This can cause flooding, and burdens the WRP system. It’s very expensive to change the WRP system to support the larger amount of water. In the last few decades, the focus has shifted from “capture, convey, and treat” traditional drainage systems. Instead, cities focus on more sustainable systems to manage storm water runoff. They are often referred to as ‘green infrastructure’. Rain gardens are one example of green infrastructure. Cities examine green infrastructure in terms of their ability to reduce the total volume of water. Cities also look at their ability to delay the arrival of water that reaches the sewer system. This reduces the burden on the WRPs that receive the water. Reducing the water flow is also helpful because it reduces combined sewer overflows and localized flooding. Green based technologies collect, treat, and filter any surface runoff to recharge groundwater, helping the storm water to avoid the collections system. Green roofs, rain gardens, and other systems collect water and keep it out of storm water. Compared to traditional drainage systems, cities believe green infrastructure technologies are sustainable and will cost less for urban areas. Recently, cities are using retention ponds or vegetated swales to retain storm water runoff However; they were not suitable for older developments or metropolitan cities because they are difficult to install. To learn more about green infrastructure and rain gardens, visit https://www.soils.org/discover-soils/soils-in-the-city/green-infrastructure. We hope you will be seeing more rain gardens, green roofs, and green infrastructure in your city! Barr Engineering Company. Burnsville Stormwater Retrofit Study: Prepared for City of Burnsville. Minneapolis, MN. June 2006. Davis, A.P. 2008. Field performance of bioretention: hydrology impacts. Journal of Hydrologic Engineering, 13, 90-95. Dietz, M.E., and J.C. Clausen. 2005. A field evaluation of rain garden flow and pollutant treatment. Water, Air, and Soil Pollution, 167, 123-138. Dietz, M.E., and J.C. Clausen. 2006. Saturation to improve pollutant retention in a rain garden. Environmental Science and Technology, 40, 1335-1340. Hunt, W.F., A.R. Jarrett, J.T. Smith, and L.J. Sharkey. 2006. Evaluating bio retention hydrology and nutrient removal at three field sites in North Carolina. Journal of Irrigation and Drainage Engineering, 132, 600-608. Hunt, W.F., J.T. Smith, S,J, Jadlocki, J.M. Hathaway, and P.R. Eubanks. 2008. Pollutant removal and peak flow mitigation by a bio retention cell in urban Charlotte, NC. Journal of Environmental Engineering, 134, 403-408. Rain gardens are just one of several methods to detain and treat urban stormwater runoff. Before the 1970’s, urban stormwater either directly discharged to streams through run-off, or was incorporated into sewer collection systems. Both contributed greatly to surface water quality degradation through increased loadings of bacteria, nutrient, sediment, pollutants, and drastic changes to natural stream hydrology or functions. Rain gardens and other soil based systems treat the stormwater, while improving natural stream hydrology back to their natural condition and functions. This is all accomplished at a lower to compatible initial cost, but more importantly do not require long-term maintenance costs.